Capt. 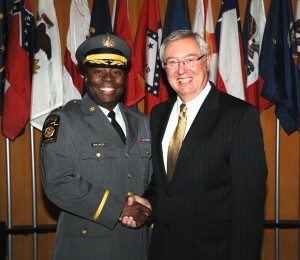 Maurice L. Tomlinson (left) is congratulated by Pennsylvania State Police Commissioner Frank Noonan. HARRISBURG – After working his way up the ranks of the Pennsylvania State Police for more than two decades, a Chester County resident and former Embreeville trooper has been promoted to captain. Pennsylvania State Police Commissioner Frank Noonan announced the promotion of Maurice A. Tomlinson and his reassignment as the director of the Tactical Operations Division in the Bureau of Emergency and Special Operations. Previously, Tomlinson recently served as the Eastern section commander in the Bureau of Liquor Control Enforcement, a state police news release said. Tomlinson, a native of Jamaica, enlisted in the state police in 1993. Upon graduation from the Academy, he was assigned to the Lancaster station in Troop J. As he progressed through the ranks, he served from 1995 to 2005 at Troop J, Embreeville. He then worked at the Bureau of Criminal Investigation, Organized Crime Task Force; Troop K, Philadelphia; the Bureau of Criminal Investigation, Tactical Intelligence Division; and the Bureau of Liquor Control Enforcement, the release said. He was promoted to corporal in 2000; sergeant in 2008; and lieutenant in 2011. Tomlinson is a 1988 graduate of Cardinal Dougherty High School, Philadelphia; a 1993 graduate of La Salle University, Philadelphia; and a 2009 graduate of the 278th session of the Northwestern University School of Police Staff and Command, the release said. Tomlinson and his wife, Ingrid, reside in Westtown Township, with their son, Spencer, the release said.